Today, here at the Keep we are pleased to announce the launch of a brand new series of 11oz ceramic mugs ON SALE from today in the SHOP section. This is the first of six in the first series of Worlds End Mugs. Themed with the Worlds End characters and Logo from the first volume, these are a great accompaniment to reading the graphic novels, ashcans and colouring & storybooks. 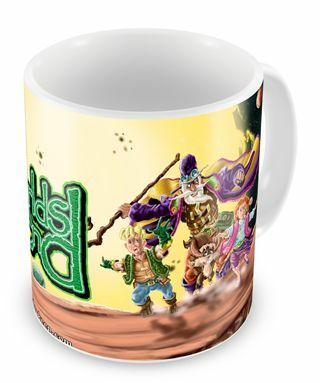 Below is the full wraparound artwork that you will see on the Mug itself. Check back here soon for more details of the further releases in this series. Look for even more NEW product ranges very, very soon too.